The man on stage is sweating profusely as he leads the crowd in song - a microphone clutched in both hands. Some 15,000 people are swaying in front of him, their hands raised in the air. 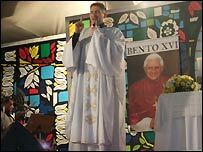 This is not a pop concert, but a Catholic mass in Sao Paulo, Brazil, celebrated by the country's best-known priest, known to everyone as Padre Marcelo. The former aerobics teacher turned cleric is now so popular that his CDs outsell every pop star in the country. The turnout in a converted factory is encouraging news for the Catholic Church after a long period of declining numbers. 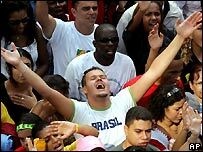 That long term fall coincides with growing pressure from Brazil's Pentecostal churches, which have been expanding rapidly. 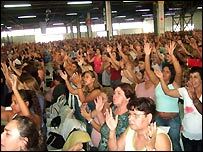 The Pentecostal churches, referred to here under the umbrella title of "evangelicals" - which includes other Protestant churches - are a powerful force in Brazil, with growing media empires, significant political representation, and more than 24 million followers. Brazil still enjoys the position as the largest Catholic country in the world, with some 125 million followers recorded in 2000. But according to the US Pew Forum on Religion and Public life, successive Brazilian censuses show the Catholic share of the population decreased by 4.1% in the 20 years from 1960 to 1980, and dropped almost three times as much in the next 20 years. By contrast, the number of Protestants increased by 2.6% between 1960 and 1980, but more than tripled the rate of increase in the following 20 years. In a sense, Padre Marcelo's "charismatic"-style masses have shown that one form of response from the Catholic Church to this growing challenge has been to imitate at least some of the spontaneous style of the Pentecostal services. 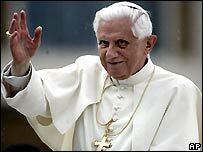 Church leaders concede that Pope Benedict, who is due in Sao Paulo this week, is uneasy about the downward trend in Catholic numbers in Latin America. "Worried is not the word, but he is concerned," Dom Odilo Scherer, Sao Paulo's new archbishop, told the BBC News website. "I think there is no bishop or pastor in the Church who is not concerned. We are not very present in the large cities. One priest is not sufficient for 100,000 people." By contrast, it seems almost as soon as a new district emerged in Brazil's sprawling cities, a new evangelical temple or church soon followed. For the poor who moved to the cities, these churches provided a ready-made social network. "They arrived here totally lost," says Professor Paula Monteiro, of Sao Paulo University. "And when they get into their little churches they start building a network, creating a world within which they can operate in the city. "This world is full of possibilities, of work, of getting to know people, of marriage. In this sense they are more connected to a social group, and they can fit in to the city life." The churches appear to have been particularly adept at helping many people deal with the day-to-day problems of life such as excessive drinking or drug abuse. In a developing country like Brazil, their emphasis on self-improvement and success in this life has also gone down well. Leonardo Boff, a former priest and Brazil's best-known voice of Liberation Theology, says the Catholic Church must take responsibility for the decline in numbers. "I believe the fault is that of the Catholic Church itself, and the rigid dogma and inability to create a new language," he says. "So many people leave and look for other churches, which have more populist language, and they are more welcoming and they allow for a sacred experience, an experience of God which is easier and more immediate." Boff was once silenced for a year by the then Cardinal Ratzinger, now, of course, Pope Benedict, so his views may not cut much ice in Rome. Even scandal, it seems, has not prevented the newest evangelical pentecostal churches from growing at an impressive rate. Over the years controversy has surrounded their relentless fundraising, often among the poorest of Brazilian society, and there have been damaging images of some church leaders on their knees counting money a little too gleefully. In a hugely controversial incident, a Pentecostal minister was seen late at night on TV kicking a statue of Brazil's national saint. Two founders of one church, Renascer em Cristo or Reborn in Christ, were recently arrested in the United States accused of smuggling thousands of dollars into the country, some of which was said to have been concealed inside a Bible. They deny any wrongdoing. The Catholic Church may take some comfort from a new study of government statistics by the Getulio Vargas Foundation, which suggests that this decline is stabilising, but the full picture will not be clear until the next census. And Church leaders will be hoping that the visit by the Pope, during which he will canonise the first Brazilian-born saint, Frei Galvao, will give a boost to morale. The Pope may have other pressing issues on his mind when he visits Brazil. The health minister here has recently said he would like to see a wide-ranging debate on the issue of abortion - currently permitted only in limited circumstances - a suggestion that has already prompted a vigorous response from senior clergy. Opinion polls suggest the vast majority of Brazilians do not endorse the teachings of the Church on birth control, and a wider discussion is under way about the ethics of stem cell research using embryos. In one of his engagements, the Pope will speak to thousands of young people in a football stadium. Their future, and the future of the Church in the world's largest Catholic country, will be weighing on his mind.